As the highest plateaus of the Pakaraima chain, Mount Roraima offers some of the best trekking trails for aficionados. It is considered as one of the oldest geological formations on Earth, more than two billion of years old. Along the way you will also be able to admire beautiful landscapes covered in numerous different plant species and home to many wild animals. Domestic flight from Manaus to Boa Vista (not included, time and flight numbered to be communicated). Airport pickup and transfer to the hotel. Meal not included. After breakfast, meeting at 9am at the auditorium of the Aipana Plaza hotel with the entire group, followed by a control of the hiking gears and a detailed itinerary reading. At around 2pm, departure by car to Santa Elena de Uairen (Venezuela - 220km - 900 meters above sea level). Arrival time at around 6pm. Meal not included. Note 1: depending on weather conditions and physical shape of each participant, the itinerary presented above could suffer a few changes, with the agreement of all. Note 2: itinerary not recommended to people suffering from medical conditions. Note 3: underage participants must be accompanied by one of their parents at least, and with the authorization of both parents. 10 years old and above. Note 4: Warning, check requirements to enter Venezuela (passport, visa...). Breakfast at 06:30am and departure at 08:00am by car to Paraitepuy (100km - 1,300m). Distribution and weighting of the hiking gears. That first day will take you to the Rio Tek / Rio Kukenan (1,100 meters above sea level) camp. Hike up to the camp, get to know the surroundings and rest at the end of the day. Your guide will inform you on the next hiking day. 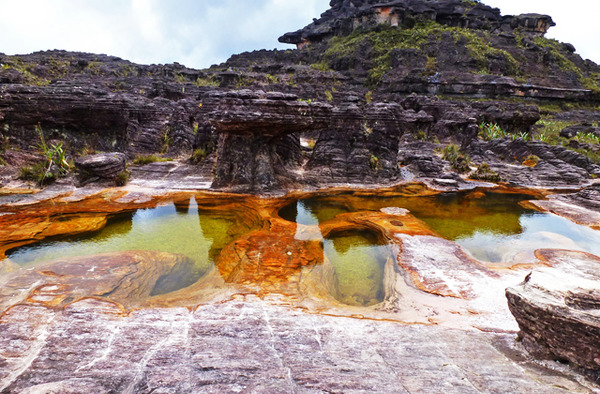 At around 8am, you will start the hike up to Mount Roraima (1850 meters above sea level). The distance isn't great but it will be more strenuous that the day before (70% of ascension). You will arrive at around 2pm where you will set camp. You can go for a swim, walk around to get to know your surroundings and prepare for the third day of trekking. At around 8am, you will start the hike up to the summit( 2,734 meters above sea level). It will be one of the most interesting parts of your trekking experience. You can take a few breaks to take pictures, admire the landscape, observe the flora (orchids) and fauna (many different bird species). You will walk near streams and a waterfall. Arrival time at the summit is estimated at 2pm. Short break to catch your breath, regroup and follow on to the camping site. All included. First night at the top. Bivouac (Temperature: 10ºC / 50ºF during the day, -5ºC / 23ºF at night, it can go up to 0ºC / 32ºF if it rains). Breakfast and departure to Vales dos Critaism Ponto Triplo and El Foso (4 hour hike) with a break of an hour and a half to have lunch and enjoy your surroundings. Back to the camp, 3 hour and a half hike. You will only take with you mandatory gear for trekking, the rest of your belongings and equipments will remain at the camp. All included. Second night at the top. Free day. It is a day for you to rest. You can go for walks to discover your surroundings, admire the landscape, with no hurry. Listen to the silent and meditate. All included. Third night at the top. Time to go back to civilization. After breakfast, you will start your way back at around 8am. A 4 hour walk down awaits you to reach the base of the Mount. 40 minute break to rest and eat before getting back to the Rio Trek camp. Arrival estimated at around 4pm (14km). End of the day free. Last step of the trekking. After breakfast, you take off again. After a one hour break for lunch, you will head to Santa Elena (100km) then Boa Vista (220km). You will arrive at around 8pm. Free dinner. Night at the hotel. 2 hours before take off, transfer to the Boa Vista airport. Domestic flight from Boa Vista to Manaus (not included, time and flight number to be communicated).